Children’s books about anger management can help kids understand their angry feelings and learn how to calm down. From books for toddlers about hitting to books for teens about controlling their anger, this list includes the best anger management books for kids. Anger management skills are important to a child’s social-emotional health and development. We need to help our children understand their feelings and build skills for coping with emotions such as anger in safe ways. Kids books about anger can help our children learn how to calm down and express emotions in healthy ways. It’s okay to feel angry, but it’s not okay to hurt anyone with actions or words. The primary way children learn basic calming and self-regulation skills is by watching and learning from the people that they spend time with. When I get angry I do my best to show my daughter appropriate ways to manage it. This includes calm down techniques, apologizing when necessary, and talking about my feelings when appropriate. I’m nowhere near perfect… I just do the best I can like every other parent out there. It doesn’t matter that I spent 4 years pursuing a doctorate in psychology, or that I have over 20 years experience teaching, coaching, and caring for children. I make mistakes, and they teach me how to be a better parent, and a better person, every day. 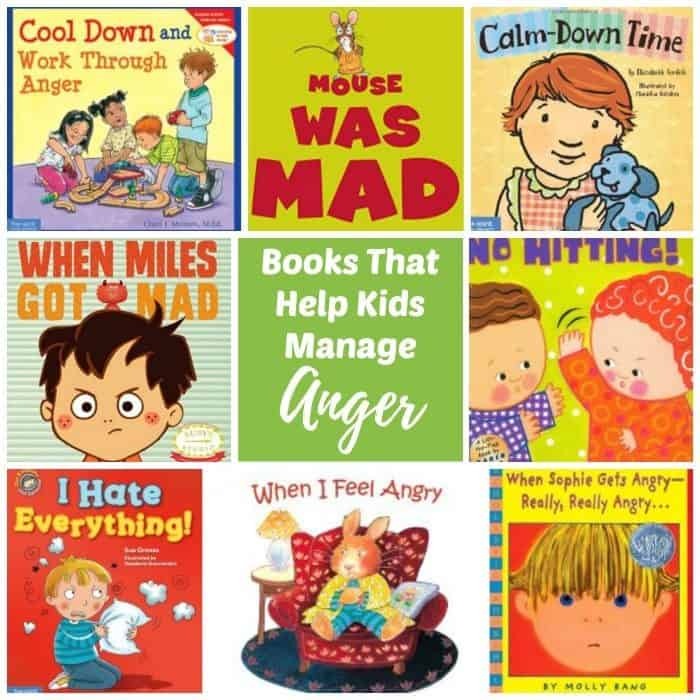 One of my favorite tricks to help my daughter learn to understand her emotions and manage anger is by reading her Children’s Books about Feelings, and Children’s anger management books like those listed below. Our family also likes to use other calming and mindfulness practices to help keep the peace in our home. Other calming activities and self-regulation strategies for kids that we enjoy are social-emotional development games, the practice of yoga, the calming effects of nature with outdoor activities, and the meditative and calming effects of sensory bottles. Help children learn to manage anger by reading them books about anger and anger management. There are books on the list below for kids of all ages; toddlers, preschoolers, elementary aged kids, and teens. By reading these stories kids can begin to understand how their emotions and actions are related and learn to manage both. I can’t promise a magical happily ever after” fairytale ending, but I can promise that reading Children’s books about anger management can help over time. Especially when you combine reading them with consistent positive discipline, and heart to heart communication about feelings, emotions, and how to deal with anger in healthy ways. The anger books for children are listed in order below from biting, kicking and hitting toddlers and preschoolers, to those hot-headed teens! Click on the title to learn more about each anger management book for children. The children in my home daycare loved this book and wanted to read it often. It shows other toddlers using simple tools to calm themselves down. This is another favorite anger book for kids at my home daycare. It’s amazing to me how much the children actually liked these behavior books. I find them strange but they totally work! This is a good book to help toddlers understand the power of words and how they can use positive words instead of negative ones…even to express negative emotions. I don’t like the title of this children’s book because teeth are for biting, just not for biting others. With that said, this book about biting is an effective tool to use with toddlers. It lists several reasons why children might want to bite while it suggests positive things children can do instead of biting. Also contains helpful tips for parents and caregivers. Yet another favorite of the kids in my care. In simple words and charming full-color illustrations, this book helps little ones learn to use their feet for fun, not in anger or frustration. This book about kicking for kids also includes tips for parents and caregivers on how to help toddlers be sweet with their feet. Great for all caregivers of children to have on hand to help when kids start hitting. It’s never too soon for children to learn that violence is never okay, hands can do many good things, and everyone is capable of positive, loving actions. The title of this book, “No Hitting” is a little misleading. Only the first page actually addresses hitting, while the rest of the book addresses other inappropriate behaviors that kids might do when they are mad. A perfect choice to help steer the kids in my home daycare toward acceptable behaviors and away from the negative ones. This book shows the Critter family saying no to everything Little Critter wants to do. Finally, mad at the world, Little Critter announces he will run away. When pals come by and ask him to come and play baseball, our young hero’s mood quickly changes. As this little bunny experiences things that make her angry, she also learns ways to deal with her anger. Ways that won’t hurt others. A simple book that gives children great options for dealing with and managing their anger. This book is a part of the dealing with feelings series that help children accept and acknowledge their emotions. Another book in this series “I’m Furious,” can be found directly below. I love that the stories give kids several ways to cope with feelings by utilizing the books’ “choose-your-own-ending” format. Another book from the dealing with feelings series like the anger book directly above. In these books, the authors provide guidance and suggestions that help parents and children find solutions that work. “Why me?” and “It’s not fair!” are favorite phrases used by Twitch, The Monster of Frustration. Though Twitch tries very hard to get everything right, he quickly gets upset when things don’t go his way. This book is a part of The WorryWoo Monsters Series of books about emotions for kids. Click through to find others in the series. A wonderful book for toddlers and preschoolers about dealing with angry feelings. A mouse is mad, and he tries all sorts of ways of dealing with his angry feelings but nothing works for him. Finally, he figures out his own way of dealing with his feelings and realizes he isn’t mad anymore. Like Miles in this story, expressing emotions in healthy ways is something that all toddlers need to learn. This fun book offers much-needed comfort to young children as they struggle to regulate their emotions. This is a favorite in our house. When I used to run an in-home childcare this book was selected to read by the children in my care all the time. One day Sophie gets really really angry! In the story, we see how she deals with her anger in a healthy way after an incident with her sister. A must read! Sam has a hard time when things don’t go his and cries, “I hate everything!” With the help of his aunt, Sam learns new ways to deal with his anger and feel better. This book is a part of another series of books about emotions that uses brightly illustrated stories to help kids understand how their emotions and actions are related—and how they can learn to manage both. At the end of each book, a two-page series of pictures invites kids to tell a story in their own words. Click through to find more books in the series. A story that introduces children to the idea that they can learn techniques for releasing anger in healthy ways. Young readers are shown how to keep an anger chart to identify the causes of their angry feelings and how to find positive ways to work through them. This book was not my favorite because it addresses what can cause someone to get mad, but did not provide a lot of solutions. I liked how this book touched on forgiving, not only yourself but others as well. There is a chapter that references God and how good Christians should behave that some readers may not want to read to their children, but I think it could be taped together or merely skipped if desired. An anger book that does a wonderful job of guiding children (and adults) through a progressive relaxation exercise as well as conveying that angry feelings can be managed. Children can relate to the angry octopus in this story as the sea child shows him how to take a deep breath, calm down, and manage his anger. It is clear, and the illustrations are inviting and helpful. 20. Cool Down and Work Through Anger (ages 4 – 8) by Cheri J. Meiners M.Ed. This book that shows kids that it’s normal to get angry. It begins with a few scenarios that might cause a kid to be angry; being left out of a playgroup, being treated with disrespect. Next, it talks about the physical feeling of being angry; hot face, tense muscles, fast heartbeat. Finally, it discusses what you might want to do if you get angry but then explains that these are not always the best choices. Finally, it gives some very helpful advice on what to do if you are feeling angry. A workbook that contains forty activities for issues such as recognizing anger triggers, better problem solving, and communication tips for defusing conflict before it gets out of hand. This anger management book for kids offers clear explanations for the child to help them to understand where their anger may be coming from, and the helpful exercises that give the child the opportunity to take greater control and ownership over themselves. Anger is a natural human emotion, but if it isn’t managed properly its effects can be devastating. Seeing Red is a curriculum designed to help elementary and middle-school aged students better understand their anger so they can make healthy and successful choices and build strong relationships. A workbook for teachers, parents, and other caregivers. It presents a clear and effective approach to helping children and adults understand and deal constructively with children’s anger. Also consists of a series of lesson plans designed to use to help kids learn to manage their anger. If you are a parent that has no desire to work with these lesson plans it may not be the best book for you. This book is written by the same author as the first four books listed for toddlers listed at the top of this post. It teaches kids how to recognize anger in themselves and others, and how to handle situations and emotions, and how to deal with the anger they feel. Read this children’s book about anger to help kids learn that violence is not acceptable and that there are safer, more positive ways to resolve conflicts. This is a great book to help parents and children deal with anger management at a young age. It guides children and their parents through the cognitive-behavioral techniques used to treat problems with anger. The author lets children know she understands what they are thinking but that it is not an excuse for letting anger brew. This interactive self-help book is the complete resource for educating, motivating, and empowering children to work toward change. Anger management skills are important to a child’s social-emotional health and development. It’s never too early for children to recognize the feeling of anger and learn to manage and express their anger in appropriate ways. We need to help our children understand their feelings and build skills for coping with emotions such as anger in safe ways. It’s important for children to understand that it is okay to feel angry, but it’s not okay to hurt anyone with actions or words. There are books on this list for kids of all ages; toddlers, preschoolers, elementary aged kids, tweens, and teens. Read the simple stories and do the activities to help children manage their anger in healthy ways. As mentioned at the beginning of this article, our family also likes to use other calming and mindfulness practices to help keep the peace in our home. A few more mindful activities for kids and families are listed below. We hope you enjoyed this list of anger management books for kids. You can learn more about Rhythms of Play HERE! Anger is such a big emotion and sometimes it gets the better of all of us. What a great round up of resources. Thanks so much for sharing! Great list, Nell! Thanks for putting them all in one place! I have found that reading these books has really helped my daughter deal with her anger in appropriate ways, and they also help me help her. They are invaluable to us. Hello Nell, I love the list! How can I buy them? So glad you like the list Derya. Just click on the photo link of the book you would like to purchase. I will receive a small commission with no extra cost to you. Thank you for choosing to support this blog! I was so happy to find a curated list with resources for anger management for kids. I think my children’s book “How to save the dragon” would be a valuable addition to the list of reviews you provide to your audience. I’m so glad that you like this list Madeleine… Your book sounds wonderful! If you would like me to consider it to add to this list I would only ask that you send me a copy for review. You can use the contact form above to request my address, or you can email me directly nell@rhythmsofplay (dot) com.